Available Monday-Friday 11AM – 3PM. When ordering off of the lunch menu, your complete party of 5 or less will be served in 12 minutes or less or your next lunch is on us! A chicken tamale & beef enchilada w/ Mexican rice. A beef chimichanga & chicken tostada w/ black beans. 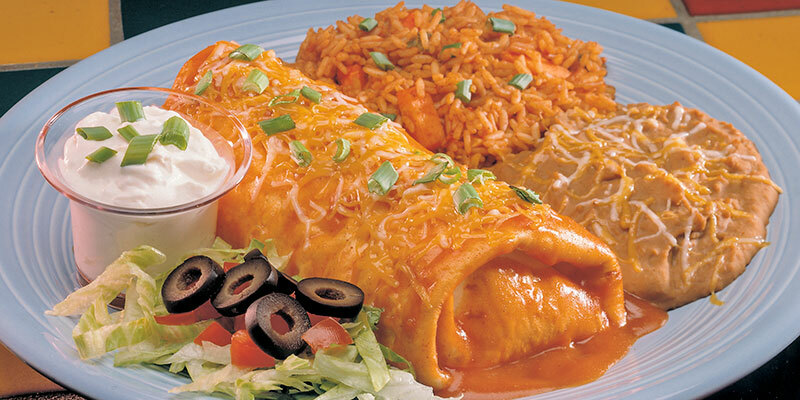 A chicken enchilada & beef chimichanga w/ Mexican rice. A chicken burrito & beef taco w/ Mexican rice. Chicken w/ queso blanco, rice, pinto beans & corn tortillas. Chili quesadilla w/ sauteed veggies & black beans. A Beef enchilada, hard shell beef taco & Mexican rice. Hard shell beef/chicken taco, pinto beans & Mexican rice. Beef/chicken taco w/ Mexican chili in a tortilla bowl. Lettuce, tomato, croutons & Parmesan w/ Caesar dressing. Lettuce, tomato, olives, meat & cheese in a tortilla bowl. A new homemade soup created daily by our chefs. Steak/chicken/pork w/ onions & peppers, tortillas & a garnish dish. Veggies sauteed w/ special seasoning, tortillas & a garnish dish. Beef/chicken/pork w/ cheese, lettuce, tomatoes & Adobo sauce. Chicken/pork tamale w/ sauce, Cotija cheese & 2 sides. Beef/cheese stuffed poblano chili with Mexican rice & beans.